We’ve identified unwanted spurious emissions from LA2SHF when installed at Vassfjellet, and taken it down for the time being. While not critical, and the spurs technically being below the limits, we’d rather play safe and also satisfy our inner engineering pride. 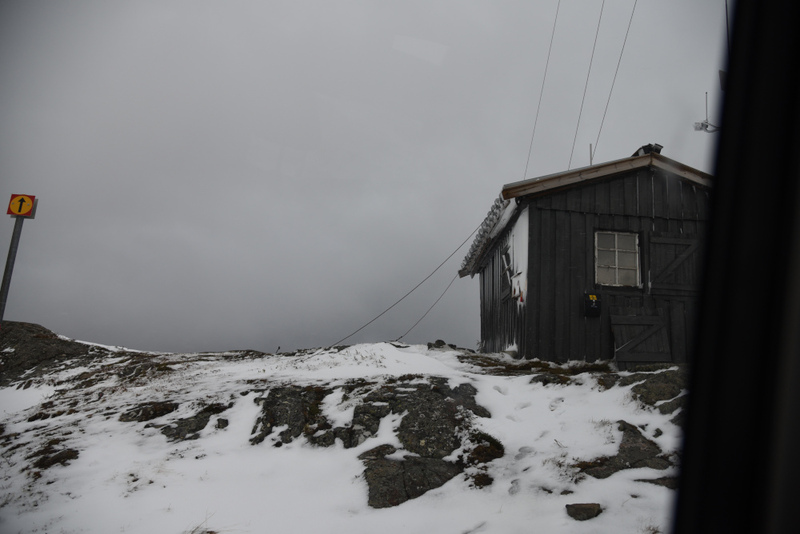 In this post, we outline a likely source of the spurs (they are actually another morse signal, and can be identified as LA2VHF/4), and describe LA3WUA and LA1BFA’s expedition to Vassfjellet last week when they went to bring LA2SHF back home. Back when LA2SHF was built, it was designed to suppress its unavoidable harmonics down to an acceptable level of around 40 dB below the main signal level. 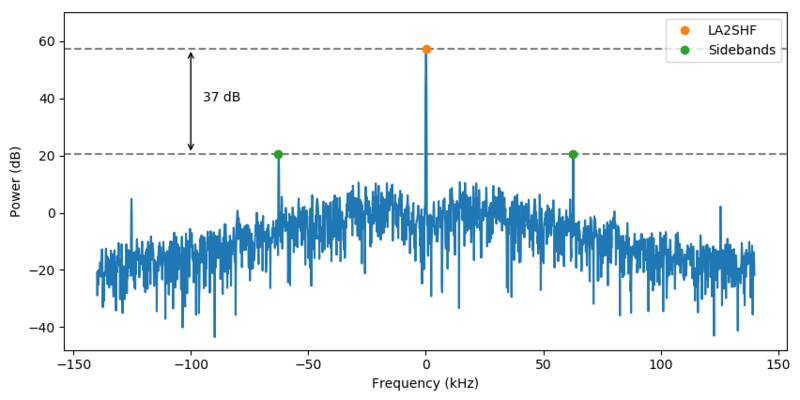 Measurements in the lab, showing LA2SHF in the main, central peak, and its first and second harmonics to the sides. The height of one square corresponds to 10 dB. 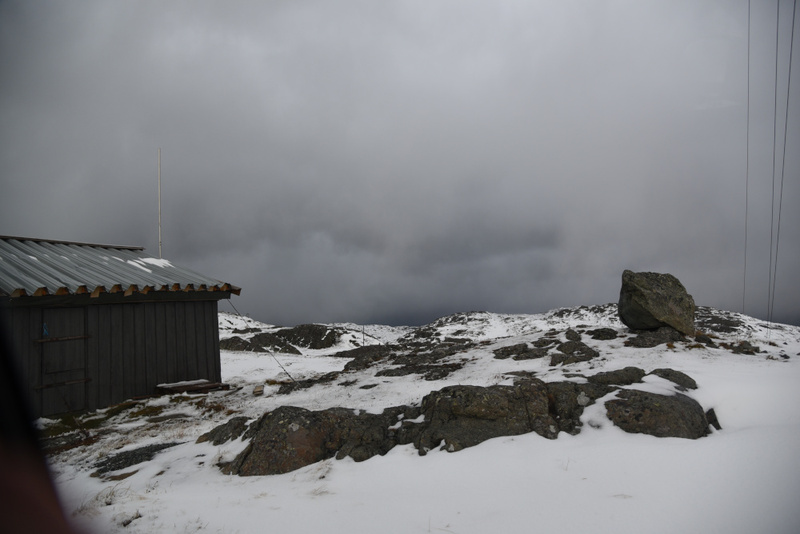 Measurements on the lab bench could confirm that the suppression was at around 40 dB and acceptable, and that our beacon child safely could be installed at Vassfjellet. All was well, until we in September were notified by email that our sidebands were not behaving very nicely, but were bullying their surroundings with too much power in the wrong frequencies. This was not something which was observed at the lab bench. Sometime after installation at Vassfjellet, the beacon started behaving differently than the earlier observed behavior. The waterfall plot could confirm this trend, with a sideband peak going up and down to the right and left of LA2SHF (beacon signal in the center). Plotting two timesteps with high and low sidebands shows the variation in sideband strength. The sideband is close to 62.8 kHz from the LA2SHF frequency, while the spur is close to 63.2 kHz from the LA2SHF frequency. 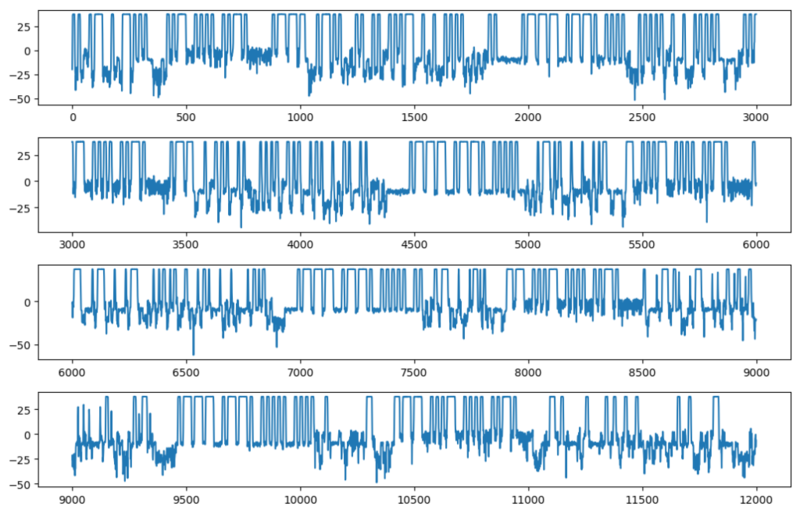 Plotting the frequency bins corresponding to LA2SHF and the first peak as a function of time partially explains the behavior, and why it wasn’t discovered until installation at Vassfjellet. 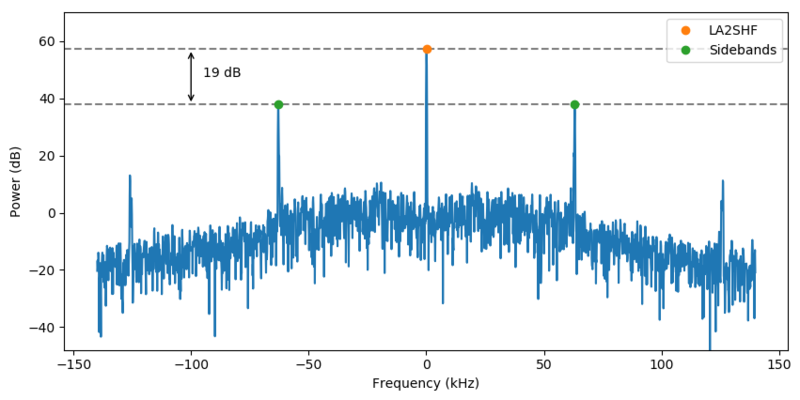 The peaking behavior with ~20 dB increase in the first harmonics is actually an entirely different morse signal altogether! This could also partially be seen in the waterfall diagram above, as the pattern in the sideband peaks were uncannily regular. Plotting up the full morse signal in the sideband bin reveals that the callsignal is LA2VHF. We have two beacons that use LA2VHF, LA2VHF and LA2VHF/4m, but only one of these have the same timing speed as LA2SHF, i.e. LA2VHF/4m. The morse signal is clear only when LA2SHF is turned on, and is otherwise on par with the noise level, but the revealing V-s are still identifiable. The working theory is that LA2VHF/4m is injected into the reference for LA2SHF somewhere along the transmission chain, and that this leads to the LA2SHF sideband having characteristics from LA2VHF/4m. The beacons LA2SHF, LA2VHF/4m and LA2UHF share a 10 MHz reference, which might have been “contaminated” with the signal from LA2VHF/4m. The synthesizer does some digital tricks in order to get a 1296.963 MHz signal. These digital tricks do not always produce a clean signal, but a signal containing spurs – and one of these spurs is likely the sideband we see around LA2SHF. Which spur mechanism it is, however, is something we need to figure out. We think it might be related to the seventh harmonic of the reference (i.e. 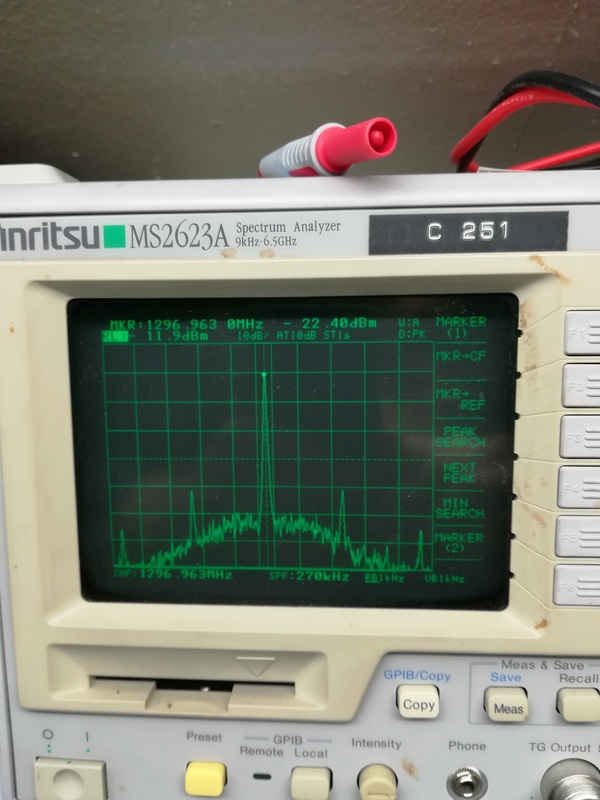 70 MHz). Somewhere along the line, LA2VHF’s 70.063 MHz signal gets added on top of the 70 MHz harmonic of the reference, and we get a CW-modulated spur. The small frequency shift we see in the spurs should also somehow be related to this. We couldn’t see this behavior at the lab bench since there were no strong signal sources with the right frequency nearby. LA1BFA Magne and LA3WUA Øyvind went on a roadtrip to Vassfjellet on Monday last week in order to see whether the problems could be debugged and fixed in situ. On the way up to Vassfjellet with a lot of snow in the road. Winter is here :-(. Photo: LA1BFA Magne. 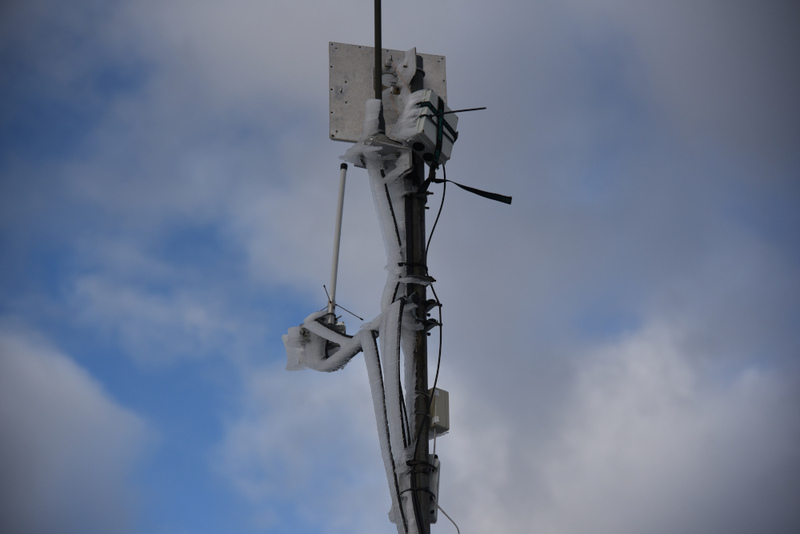 Antenna covered in snow. Photo: LA1BFA Magne. A view of our beacon cabin. Photo: LA1BFA Magne. Another view of the beacon cabin. The window shutters have fallen off, and the ropes are no longer tight. Photo: LA1BFA Magne. Unfortunately, the problems weren’t immediately fixable after having verified the problem on the spot and tried a couple of possible measures. Night was fast approaching and the weather was starting to get bad, so they took the beacon back to Samfundet again for the time being. We’ll investigate it and try to reproduce the interference problems in the lab, and put the beacon up again before winter starts in earnest. 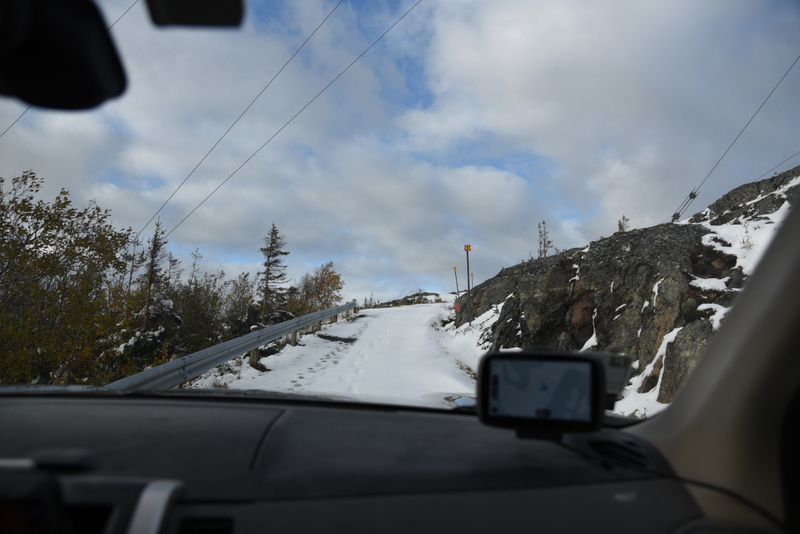 The weather is currently slightly cold and stormy, and we expect that we will have to wait for quite a few mild days before the road is clear from snow again and we can return. A couple of other problems that became apparent during this trip is that the shutters have fallen off one of the windows, and that the cabin might have sagged a bit, judging from the ropes tying it down. We will have to replace the shutters before winter, otherwise the beacons are in for a hard time during the worst winter storms. This post ends on a slightly negative note, but we remain hopeful that we will prevail with fixing both beacon and cabin before it is too late :-).